For the past 40+ years, I’ve not been a fan of anything sweet. In fact, I usually pass them over and wouldn’t give them a second thought unless I have a friend with me who insists on getting something to finish off the meal. On a fateful evening in September this year, I was at the ConnectOC event and not in the mood to stand in line to battle the crowd for a taste of the hot food. I walked around the premises and noticed a pretty tower of cupcakes on display. My friend Mahesh was on it within seconds. He took a cupcake off the tower and immediately sank his teeth into it. I asked “are they good?” and then wondered why I had even asked that question because regardless of the answer, I probably wouldn’t be impressed. He nodded all the while munching on the cupcake without pausing for a second to verbally explain to me how they tasted. I was hungry and it was better than nothing, so I carefully looked at all the labels and selected a chocolate peanut butter cupcake and took a small bite. My brain took a few seconds to connect to what my mouth was tasting. I think it was in sheer confusion since my mouth was obviously sending off signals indicating that this was the most fantastic cupcake — oh heck, ANY cake — to ever touch my lips, yet, the brain wasn’t able to process something it had never experience before. It was just as well that back then, owner Kristin Ausk’s magical cupcakes were only available through catering or through ordering, otherwise my insanity would’ve started a lot earlier. They weren’t readily available for retail sales so that kept me at bay for a while longer. A few weeks ago, Meringue Bake Shop’s cupcakes started offering their delights at the newly formed Irvine Farmers Market at the Great Park and I was there like a lightning bolt, buying all the flavors available, including red velvet, orange crush (which won at the OC Cupcake Camp), and pumpkin vegan. My absolute favorite was the red velvet, and I ate frosting and all which is something I never do. Orange crush was a tad too sweet for me, but I devoured the cake portion without any trouble at all. The most amazing part was one of the orange crushes were hidden at the back of my fridge for an entire week and I found it on Saturday evening thinking it probably wasn’t going to be good anymore, but I was wrong. The cake was still delicious. What sets these cupcakes apart is how moist the cake portion of the cupcake is and manages to stay moist even a week later. I’ve never tasted anything like it anywhere else. The cake is soft, beautifully textured and highly addictive. The frosting ranges from perfect (for my taste buds) to a little too sweet for me, but highly palatable and never grainy or sickly. Since they started at the Great Park Farmer’s Market, there hasn’t been a week I’ve been without a cupcake. If I can’t get there myself, I send a friend to pick some up for me. Sea salt caramel, one of the flavors I’ve been waiting to try is as audacious as it sounds. It reminds me of the Asian-style sweets which generally uses a touch of salt to off-set the sweetness. I was immediately taken by the salty sweetness of this phenomenal mini cake and since then, a new salty sweet addition has been added — the bacon cupcake. 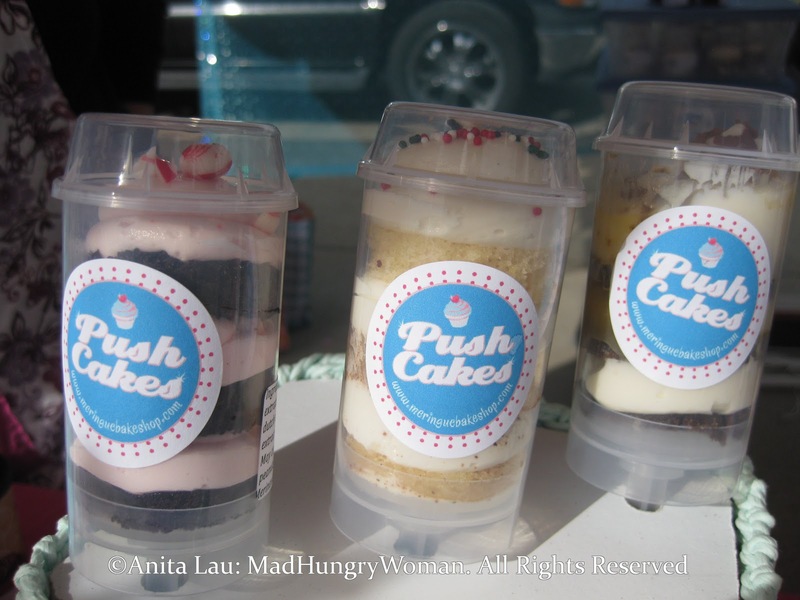 Kristin started her new Push Cakes a few weeks ago and these little ‘pops’ are encased in a little plastic ‘popsicle’ container which you push up to reveal the cake/frosting combo. The idea is genius and they travel really well so you get the same delicious taste without making a mess. Right now, Kristin is featuring her holiday selection and the photos I’ve posted here reflect how pretty and festive they look. The chocolate peppermint is very tasty and I also loved the gingerbread. The chocolate peppermint push cake is also beautiful and travel so well if you want to bring them to a party! As my friends will tell you, anyone who can get me to love eating their desserts, and leave me wanting more is a master dessert maker in their own right, and Kristin Ausk definitely is that woman! Had I not been too lazy to stand in line that day, I would never have tried these cupcakes and never would know how much I do love cupcakes. It’s just that I’ve never met a cupcake I liked before. This year has been one of surprising changes and I’ve been finding that I’m liking a lot of things I previously thought I didn’t. But then again, it takes an extraordinary person to make me view things in a completely different light and Kristin Ausk is that baker extraordinaire! I’ve never been more excited to visit a farmer’s market that has nothing else luring me to it other than these addictive little cupcakes which always bring a smile to my face. >The new flavors look delicious! I am a real sucker for egg nog. >I don't like drinking egg nog at all so this cupcake didn't blow me over like it probably would someone who loves egg nog. I did love the gingerbread and the chocolate peppermint — soooo good. She used a bit of peppermint candy crushed on top so it gave it a nice texture contrast! >I am so thankful that Kristin started selling these just minutes from my home every week!! This was the only week in the last 4 that I wasn't able to swing by for a cupcake! I have been lucky enough to taste a ton of her flavors of cupcakes but also some of her other amazing baked treats including cupcake sized fruit pies (! ), chocolate raspberry brownies (!) rice krispy treats (they really were better than I can make at home). Kristin is a total pro, one of the sweetest people I know and I wish her all the success in the world! >I love Kristin's delicious cupcakes! Favorite red velvet, and I still have to try the push cakes. Great review (now I am salivating)…. >My favorite is the red velvet as well, but I also love so many others like the sea salt caramel. The new holiday flavors are awesome as well!! Glad there are so many Kristin fans out there. >That's exactly why I love Kristin's cakes Shari, that they're never too sweet. >Thanks to Mahesh I was able to try the following: Egg nog, Red Velvet and Chocolate peppermint. They are amazing. I was surprised that I actually liked the egg nog, as it's not a preferred taste of mine, but for some reason I loved this cupcake. Favorite is the chocolate peppermint. But I haven't tried the sea salt caramel yet. I have a feeling that will become my favorite. >I ate my first PushCake yesterday. I loved it! I've always arrived too late and they were sold out. But, yesterday, Kristin found one she had put aside. It's cute, fun and delicious. 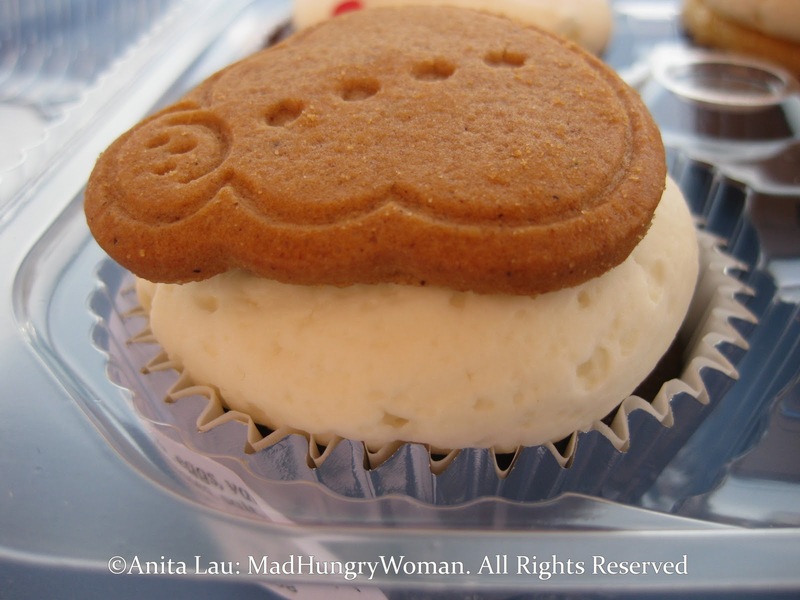 I also loved, loved, loved the EggNogg cupcake. A new Meringue Bake Shop favorite!